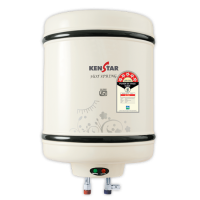 This kenstar hot spring 15 L water heater is a 5 star rated with metal body. It has thermal cut out with long life of heating element and overheating protection. This water heater comes with 2 kilowatt higher kilowatt for faster heating. To Recieve updates and possible rewards for Kenstar Hot Spring 15 L please sign in. To Recieve updates and possible rewards for Geyser/Water Heater please sign in.